Awwww yeah, Titans! See what life is like at Sidekick Elementary and meet the new staff! Follow the madness that ensues when Beast Boy gets a puppy friend! Witness what happens when the girls meet a pink stranger with a melted ice cream cone! Find out what makes Cassie such a trendsetter! All your favorite Titans, in their cutest possible form, are here and waiting for you! The Fearsome Five have arrived, and they have their eyes set on the Tiny Titans playground! Plus, Beast Boy has a crush on a rock-throwing lass and Cyborg helps bake a cake. All this and more in our second all-ages, all-fun issue! More zany Tiny Titans adventures! Alfred lets the boys spend an afternoon in the Batcave, a high-spirited debate occurs when the Tiny Titans try to figure out the difference between a superhero and a sidekick, Show-and-Tell day at Sidekick Elementary has hilarious results, and see how Beast Boy tackles science class. Find out what happens when Robin's life goes to the birds! Meet the Little Tiny Titans as they show Wonder Girl just how tough babysitting can be! See why being Beast Boy's dentist isn't all it's cracked up to be! 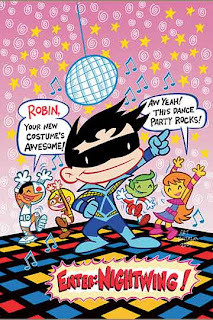 The TINY TITANS title is exactly what kids’ superhero comics should be: fun, smart and meant for kids. The story lines are not complicated or heavy handed, didactic or overly simplistic, hyper-sexualized or violent. Rather, the plot focuses on the daily grind of the typical kid: teachers, parents, principals, homework, puppy love, school-yard bullies, and fights over rights to the swing sets. 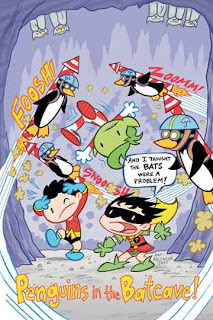 For the lover of the teenaged Titans, there is plenty to draw upon what with all the future enemies of the Titans smack dab in the lives of the TINY variety: Deathstroke, the Penguin’s penguins, and of course the Fearsome Five. Deathstroke, who chooses his given moniker of Mr. Slade, is the school principal. The Fearsome Five are the recess bullies trying to take over the playground. 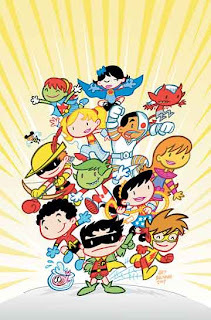 As kids gets older and move into the TEEN TITANS they will appreciate the inventiveness of TINY TITANS and the incorporation of TEEN TITAN mythos into the younger title. TINY TITANS is clever and cute. If I were going to the comic book store to pick out one title for a young elementary child’s first superhero comic this title would be it. Come to think of it, I have just done that very thing today, and my daughter and I cannot wait for the 8-year-old twin boys to get their first taste of the TITANS. Awww, yeah. When I introduced TINY TITANS to the fifth graders, they read they quick-as-you-please, laughing at their desks and sharing the short stories with their friends. TT is unlike most mainstream comics in that it offers a vignette style comic, full of short stories. Perfect for an elementary classroom and for struggling readers, and one of my top favorites for kids. Baltazar has an unmistakable artistic signature. It is iconic and accessible to children without being foolish or inane. Unlike his other popular book, PATRICK THE WOLF BOY, which is black and white, TINY TITANS is colorful, something the children love. The art is perfect for its audience. While aimed squarely at soon-to-be comic fans, there is nostalgia, excitement and laughs to be had, especially from the adult who gives TINY TITANS as a gift. I introduced TINY TITANS to a class of fifth graders, while I was completing a student teaching experience. It was a title that was routinely checked out and read between assignments. I have also used it in a formal lesson plan to primary students to teach story basics: beginning, middle and end. The vignette style of 1- to 4-page stories allows a teacher to do a quick read aloud on the document camera and study the story. It would also be helpful when exploring the five elements of fiction: setting, plot, character, style and theme. 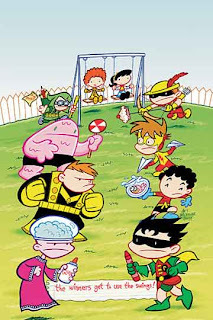 TINY TITANS is a current title offered by DC Comics. The individual comics are all available and a trade paperback is soon to come. This is a perfect time to get on board with a new comic from the first issue. This title is from the creators who brought you the very entertaining comic, PATRICK THE WOLF BOY. I love the TINY TITANS, especially for youngsters new to comics. It introduces children to a rich mythos on their level. I have the individual comics, but I am keeping an eye out for the trade paperbacks (several issues are bound together in one volume). I will buy those for the classroom too. TINY TITANS is a must-have for the elementary comic library.